Just a quick post to keep you all updated! This is the final week of evaluations and so I am almost in the end of these terrible, terrible exams! 3 days and counting!! um post muito rápido para vos actualizar! Esta é a última semana de avaliações e portanto estou quase no fim destes exames terríveis! Faltam 3 dias!! Zara dress, jacket and belt. Carolina Herrera ballerinas. Blazer and dress, that's what I need- ASAP! :) Looking pretty dear! Cute Zara look, floral prints are so good on you! love the green! & that bag is gorgeous! congrats on the end of exams & finally relaxing! How gorgeous are you! You look way too fresh and cheerful to be stressing out over exams. Are these your post exam happy face? Not long to go now. What a nice explosion of colors!! I like your dress so much!!! You're energetic!!! What a fantastic summer dress. The print is so pretty, and I love the shoes! This dress reminds of a Monet painting or some beautiful impressionist garden...but in bright, spunky colours! Love it! Me encanta! El look muy colorido y alegre :) besos! Lovely, Leonor! Good luck on your exams!!! love the dress, so cool! I'm following, hope u will follow back! 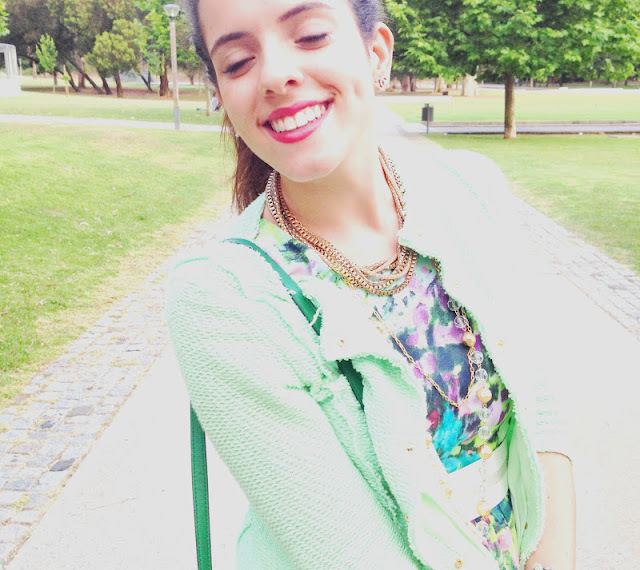 Love your floral dress with the green cardigan! Love your jacket...the color is great and so on trend! Thanks for your lovely comment! Sure we can follow each other! I'd love to! PS: you got such a great smile! Great outfit, you're very beautiful, compliments! Thanks for your visit, I follow you with pleasure, I wait you on my blog :)! I'm following you now,hope you follow back! This outfit is so cute!Love your smile! ohh I have some problemwith blogger:( and I don't see you among my followers, can you add me once more? look so cute! I like your blazer! of course dear I'm following you with chicismo, facebook, google e bloglovin....weating for you to do the same. really nice this outfit love the blazer. OMG this outfit is so perfect! I'm loving it! you look so cute! love the dress and the jacket too.. good luck in the exams! :-) i'm following on GFC now.. hope you'll do the same! I hope everything is fine with your exams! Your outfit is amazing! I really love this dress! you look likeyou stepped out of an italian magazine! you are so pretty! I loooove your dress a lot - the colour/print is very nice. Good luck on your exams! ohh I see you now:)! thank you! Beautiful outfit dear , love your shoes ! Thanks so much for your lovely comment,it means alot that you like it. Your dress is absolutely gorgeous,the colours and print are so sweet,you have a fab blog and gorgeous style so of course Id love to follow each others blogs. love the dress, australia doesn't have zara where I live, so jealous! Good luck! U are full of energy like always!